A join condition that evaluates to true only when the named node is a descendant of another named node. 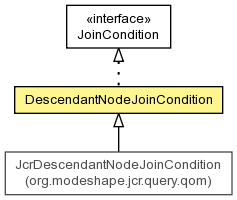 Create a join condition that determines whether the node identified by the descendant selector is indeed a descendant of the node identified by the ancestor selector. Get the name of the selector for the ancestor node. Get the name of the selector for the descedant node.